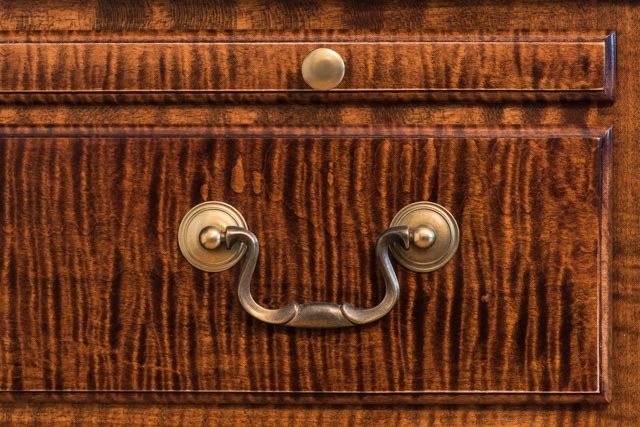 The figure in tiger, or curly, maple is a feature of great potential beauty. But how can you finish it to bring out its full loveliness? You can, of course, give it a clear finish—like General Finishes Arm-R-Seal or a water-based finish such as General Finishes High Performance. This will reveal the curl as a lightly shimmering variation in a tone that adds subtle elegance to a project. To make the figure pop a little more, apply a first coat of General Finishes Seal-A-Cell before completing with Arm-R-Seal. But what if you want to apply a dye to stain your project a deeper color? In that case, trace coating your project with a dark dye opens up some good possibilities. Trace coating is a process I learned from Charles Neil that involves applying a light coat of dye to the wood before sanding so you can tell when sanding is complete. Following Neil’s procedure, I finished a tiger maple sugar chest using the trace coating process. Here’s how I did it. I wiped on a coat of General Finishes Medium Brown Dye Stain—in this case full strength—to the case and other parts. Then I sanded them to 120 grit until much, but not all, of the dye was removed. I wanted the dye to remain in the curl, which is the more absorbent part of the wood. Then I applied a second coat of Medium Brown Dye Stain, this time sanding to 180 grit. Again, I left dark patches in the curl, rather than sanding all of it away, so it looked a bit like a zebra. Finally, I applied a mixture of General Finishes Orange and Light Brown Dye in a 3:1 ratio, which gave the piece an overall deep orange-brown color but left the curl highlighted in darker brown. I completed my finishing by spraying several coats of General Finishes High Performance Polyurethane Topcoat and then buffing with ultra-fine sanding pads after the finish was dry. 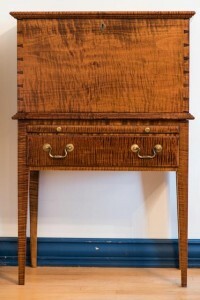 The photos show the result, which is especially good for period furniture pieces. There are alternatives to this method and you may want to develop your own processes through experimentation, something that’s always recommended before finishing any project. For example, to create even darker curl patterns, consider using Dark Brown or even Black dye for the trace coating, or Light Brown if you want to lighten the shadowing effect. And of course the overall color can be changed by using different mixtures of dyes. In the course of your experimentation, you may come to define your own signature style for coloration of your tiger maple pieces. Norm Reid is a woodworker, writer, and woodworking instructor living in the Blue Ridge Mountains of Virginia with his wife, a woodshop full of power and hand tools and four cats who think they are cabinetmaker’s assistants. He is the author of the forthcoming book Choosing and Using Handplanes. He can be contacted at nreid@fcc.net. This is a Question… not a comment. I have a dining table that has a Tiger Maple faux finish. It was probably manufactured by machine in a scandinavian country. A re-finisher stripped a leaf before realizing it was a faux finish. I realize I’m emailing someone who specializes in the real thing, but I’m trying to fix this problem. Are you aware of a faux finishing tool that I could source? PS Your photos are amazing. I am totally in awe of tiger maple. 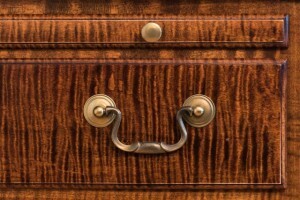 I also love burled oak but have found a whole new world by reading your blog. Thank you so much. We recommend you check with faux finishers in your area to have them recondition your piece back to original condition. Keep in mind faux finished furniture that looks really good happens from practiced skill and artful application. Jumping right in to a dining room table as a first project would be consider quite ambitious.